The re-branded Greater Anglia franchise, owned by Abellio East Anglia Limited, commenced its nine year run on Monday 17 October ﻿with promises of a transformation in rail services in our region﻿. Read the EDP's report "What the next decade holds for our rail services". Long John Hill Bridge works completed. The picture gallery has been updated now that the road has re-opened. Did anyone else notice the bridge height signs anomaly? See the full gallery here. Hot on the heals of signing the deal for Bomdardier units Abellio has now ordered 58 FLIRT UK trainsets from Stadler. See report in Railway Gazette. Described as the largest rolling stock deal since privatisation a deal for 665 Bombardier EMU cars was signed on 29 September. See reports in Railway Gazette and RAIL. Over the August Bank Holiday weekend bridge replacement work took place. Click here or on the photo below for a gallery of photos taken on the16, 17, 27, 28 and 30 August. The three day blockade of the line ended in time for London services to run on Tuesday 30 August. The new bridge deck on 16 August. A broken down train near Norwich on the afternoon of 25 August caused considerable delays for passengers. The 1512 Cambridge to Norwich service passed Trowse junction 2L and arrived Norwich 60L. The 1430 from London arrived 58L having passed Trowse 5L and the 1530 was cancelled on arrival at Ipswich. From Norwich the 1630 (London), 1638 (Cambridge) and 1640 (Gt Yarmouth) were cancelled. ​Information about performance is published on the Network Rail website and shows, for example, responsibility for delays split between operators and NR. New Rail Station for Norwich? The old railway bridge which carries the GEML over Long John Hill in Norwich is due to be replaced over the August Bank Holiday weekend (See EDP report). Work has been taking place on an adjacent site to build the new structure which will be moved into place once the old bridge has been demolished. A bus replacement service will be in operation between Norwich and Ipswich - See AGA website for details. RAIL magazine and International Railway Journal. Abellio East Anglia will run the franchise from October 2016. See Dept. for Transport announcement. Eaton Park miniature railway - changes to public running days. ​As reported in the EDP the Norwich and District Society of Model Engineers has decided the miniature railway will no longer be open to the public on the last Sunday of each month. Although the change starts this weekend (Sunday 29th), Bank Holiday Monday running the following dayin support of East Anglia's Children's Hospices is unaffetced. Blythe Road Railway Park Southwold wins planning permission. As reported on the Southwold Railway Trust website and in the EDP on 18 May, Waveney District Council has granted permission for SRT to develop the park on the site of the Old Gasworks along Blyth Road. Documents relating to the application are published on the WDC Planning Portal. West Coast Railways back on track. On 23 March the Office of Road and Rail lifted the prohibition on WCR operating on the mainline network - see ORR website. On 13 April RAIL ran a Q&A about the decision with Ian Prosser. Vivarail's first rebuilt D-Train close to mainline run. On 17 March we enjoyed a talk by Andy Hamiliton about the Vivarail Class 230 D-Train Project. On 18 April RAIL reported Vivarail hopes to have certification and agreement with Network Rail on network compatibility by the end of May so mainline testing and mileage accumulation can begin. Collision at Hockham Road level crossing near Thetford. See RAIB News item and EDP reports: 11 April and 22 April. 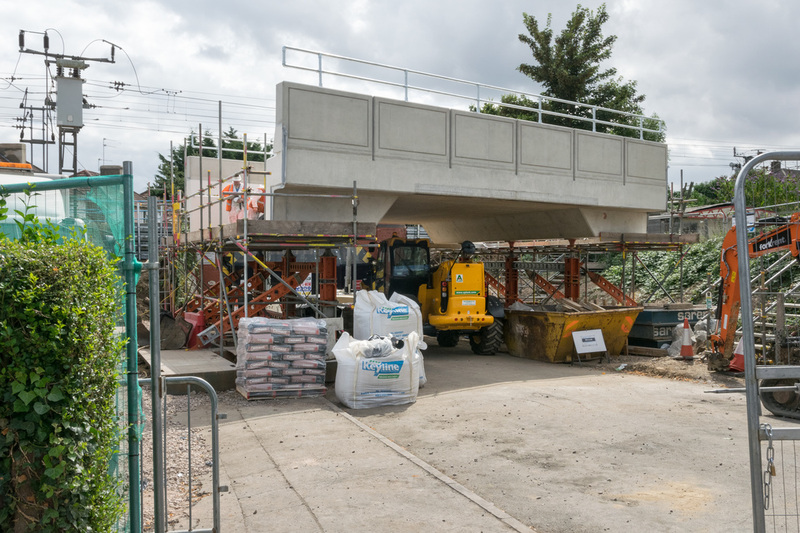 Norwich railway bridge at Lakenham to be replaced over the August bank holiday weekend. See EDP report. Flying Scotsman visit to Norwich on 25 May cancelled. The EDP reports that Flying Scotsman's return run from Ely - Norwich has been cancelled due to concerns spectators will get too close to the tracks. Click for details. AGA are to run a special charter train "The EACH Explorer" on Saturday 30 April - Click for details.